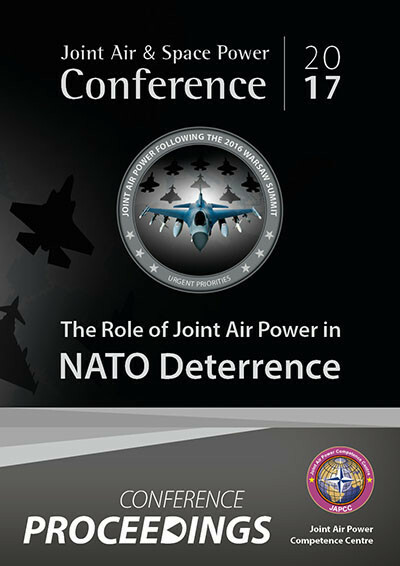 In bringing together some of the previously debated Conference themes, the Conference concluded with a briefing and discussion on the findings of a recent Study carried out by a team of distinguished academic and former senior military officials into urgent priority areas for improvements to NATO’s joint air power capabilities. The study was a consequence of conclusions from both the Wales and Warsaw NATO Summits which led to HQ SACT commissioning an analysis of air power’s urgent (short to medium term) deficiencies in capabilities and competencies. This study (which can be referenced through the JAPCC website at https://www.japcc.org/airpowerafterwarsaw/) will be a key input to NATO’s Joint Air Power Strategy which is currently being drafted. In addition to the panel discussion, the distinguished team members also provided every Conference attendee with a hard copy book summarizing their findings. The JAPCC staff very much hope that this additional material will further enrich the debate on this topic and, as always, welcome post Conference feedback on any aspect of the report’s findings. In opening Panel 4, the point was made that potential power is not real power and NATO needs real power if it is to successfully deter. Real power derives from real investment – ideally at the mandated NATO level of 2 % of GDP – which is translated into credible, combat capable forces which are made available to NATO through the force generation process. Of note, 9 NATO nations and 3 of its partner nations feature in the world’s top 20 GDPs, while only one of the top 20 is a potential adversary. To remain credible, NATO’s combat forces must be unleashed by prompt political consensus. Of note, even after the dramatic events of 9/11, the achievement of full political consensus across NATO took a full month. For NATO’s joint air forces to be credible and effective they must be capable of deterring and defending against the full spectrum of potential threats and must be deployable, sustainable, interoperable, capable of operations in degraded environments and highly ready. This costs – and costs a lot. However, it is a price worth paying because NATO must also consider the question of ‘what happens if deterrence fails?’. In such circumstances, it is these same high readiness air forces with their speed, flexibility and range that will be the first to respond, to defend, to deliver the early counter punches and to maximize the effectiveness of the follow-on force. Air assets alone are uniquely placed to fulfil this role. There is an urgent need to improve education and awareness at all levels, both militarily and politically. Topics such as A2AD, air defence and deterrence mean different things to different actors. Better, more realistic wargames – that start at Day 0 with initial hostilities and associated political decisions – would help to educate senior political leaders either through their active participation or as observers. We must find better ways of articulating risk to our political masters and the re-establishment of pol-mil trust is a key part of this. Functionally, the Study concluded that there is an urgent need for the establishment of a standing Air Operations Centre (AOC) with a fully manned peacetime establishment and Joint Force Air Component (JFAC). Consideration should also be given to the establishment of a standing, fully manned ISR Division within NATO Allied Air Command HQs. The Study’s authors also felt very strongly that a change in nomenclature away from Air Policing to Air Defence was required. Finally, the development of a strategic Indication and Warning System and the standing up of a NATO Processing, Exploitation, and Dissemination (PED) Centre was thought to be of great value in the development of skills with the alliance. Whilst the Study reinforced the need to significantly improve the readiness, deployability and sustainability of NATO’s air forces, it noted that there should be an overt acknowledgement of the increasing difficulty of rapidly gaining air superiority in an A2AD environment. NATO must not fall into the trap of becoming complacent as a result of its operational experiences of recent decades. In articulating these arguments in the current drafting of NATO’s Joint Air Power Strategy, the need to use easily understood language (‘Joe Six Pack’) was again highlighted: the publics and budgetary decision makers within NATO member nations must be made to understand why air power matters. In both enhancing deterrence and potentially transitioning to fighting in a contested environment should deterrence fail, European air forces need to increasingly generate the capability to operate with declining assistance and participation from the US. If the North Korean crisis escalates, the US will pivot, and forces will be reallocated. European air forces need to prepare for such a contingency; additional investment in key supporting enablers such as ISR, mobility and air refuelling must be urgently considered. Space and cyber are both critical and the boundaries between domains must be clearly thought through with C2 procedures developed that reduce boundary frictions and enhance both operational efficiency and effectiveness. In an era defined by ever reducing financial resources and a complex and challenging security environment, it is vitally important that NATO members and partners cooperate far closer with industry in the field of research and technology if NATO is to maintain and enhance the capabilities of its forces to both current and new, emerging threats. It was argued that, to stimulate and enhance technological and industrial cooperation between allies and partners, an increased focus should be placed on mechanisms and attractive incentives to generate new opportunities. In this regard, The Framework Nation Concept offers the optimal choice as the best environment and prospect for close cooperation between NATO, its partners, and industry. In a period of constrained funding, priority for research and technology should be given to those technologies with applicability in a hybrid/contested environment. Open standards should be used as tools to stimulate innovation and new ideas. Timing is key and Alliance nations must be encouraged to share thinking and conceptual ideas very early with industry and seek to form innovative partnerships in order to deliver the required effects early. Finally, NATO should look to intensify cooperation with the EU and develop instruments to make cooperation among industrial partners more attractive. Sadly, the limited time available for the results of the Study to be articulated and discussed did not do justice to the breadth and depth of this topic. The JAPCC therefore very much hopes that attendees will take the opportunity to review their take away copy of the Study Team’s Report and provide the JAPCC with comment. The JAPCC will then act as a conduit for this feedback to be provided back to HQ SACT. Thus, Conference participants, be they from the military, from academia or from industry will have had an invaluable opportunity to help shape NATO’s Joint Air Power Strategy.